Celebrations all around for Stortford Interiors as Stephen Byrne wins the coveted ‘Future leader’ award at the 2016 FIS President’s Awards lunch, with Frank Lohan achieving runner-up for ‘Outstanding Employee’ of the year! The prestigious industry Awards, held on 23 February 2016 at the Plaisterers’ Hall, London, recognised both Stephen Byrne and Frank Lohan for their outstanding individual contributions and achievements in the finishes and interiors sector. The FIS President, Steve Coley, led a judging panel and also presented the awards in front of over 300 members and guests from within the industry. Stortford Interiors’ Project Manager, Stephen Byrne, who joined the company in August 2014, won the ‘Future Leader’ award for his management of a challenging ten story CAT A fit-out of London’s iconic skyscraper, The Shard, whilst simultaneously overseeing a number of smaller projects. He was distinguished for showing all the qualities of a future leader; demonstrating leadership potential, commitment to personal and professional development, strategic networking capabilities and a heightened sense of self awareness. Contracts Manager, Frank Lohan, was named runner-up for the ‘Outstanding Employee’ of the year award. This is in acknowledgement of his commitment to the industry and his superior standard of work on Stortford’s first ever high-end residential development, Riverwalk, in which he excelled over and above his responsibilities. Stortford Interiors (UK) is a specialist interior architectural package contractor, focussing in the supply and installation of wall, ceiling and total interior solutions for the commercial workplace across the UK to a superior quality standard. 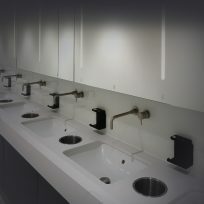 The in-house joinery division Parkrose offers specialist expertise joinery and washroom fit-out.